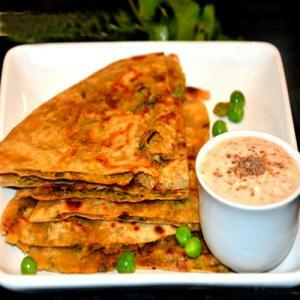 Matar Ka Paratha is stuffed paratha with spicy green peas and is a delicacy. This can be one dish meal served with side of yogurt or pickle. Firstly in a blender take 11/2 cup peas. Also add handful coriander, 1 inch ginger and 2 green chilli. Blend to smooth paste adding 2 tbsp water. Now prepare dough by taking 2 cup wheat flour in a large mixing bowl. Also add 1 tsp cumin, 1/2 tsp garam masala, 1/2 tsp aamchur, 1/2 tsp salt and 2 tsp oil. Add in prepare peas paste and knead dough. Further pinch a ball sized dough, roll and flatten it. Further roll it in a thin circle like chapati or paratha. Now cook the peas paratha on hot tawa adding oil / ghee.